Princess Cruises believes a 61-year-old man, a US citizen traveling alone, went overboard from Golden Princess somewhere between Fiji and Sydney. Details appeared in the May 5 edition of Cruise News Daily. And Aren't There Supposed to Be 40 Thieves in the Deal? Norwegian Cruise Line Holdings has partnered with China's Alibaba Group to market Norwegian Cruises in the Chinese market. Alibaba is the world's largest online and mobile commerce company. The complete story appeared in the May 5 edition of Cruise News Daily. Azamara Club Cruises has been approved to operate four new 2018 cruises to Cuba, each with a different itinerary. These are in addition to the two they have approved for late 2017. These itineraries are a bit longer and, for the most part (except for one Panama Canal cruise), concentrate on Cuba with another port or two added for variety. Carnival is now offering passengers the opportunity to pre-purchase their wi-fi package on two ships (Carnival Vista and Carnival Fascination), but it will be offered on all ships by mid-summer. Royal Caribbean declaring a quarterly dividend. 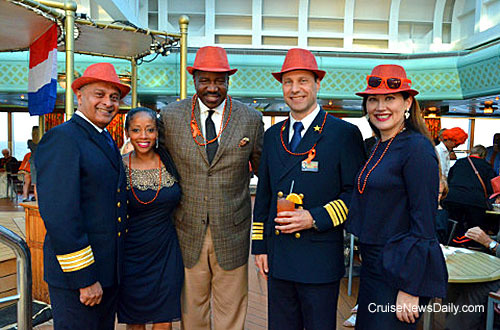 Holland America executives going aboard Oosterdam last week to celebrate Koningsdag. Shown below are Oosterdam's Hotel Director Prem Kainikkara; Senior Director of Trade Communication and Engagement Denella Ri’chard; HAL President Orlando Ashford; Captain Michiel Willems; and Vice President of Sales Eva Jenner. What's That I Smell in the Breeze? Do I smell smoke? Hickory smoke? Something new in the Breeze? Yes, Carnival Breeze is back from a two-week dry dock at the Grand Bahama Shipyard and it has a couple of new venues to titillate the taste buds of Galveston cruisers. Most cruise ship passengers give very little thought to the ship's lifeboats. It's actually a major piece of equipment, and it has to meet some very tough standards. The lifeboats for Royal Caribbean's Oasis-class ships, are very special because of the ship's size, since it's the largest cruise ship in the world. Austria's Palfinger Marine won the contract to supply the lifeboats for Symphony of the Seas, now under construction for delivery next year. The contract was actually awarded two years ago in 2015 for 24 tenders, 12 lifeboats (larger than the tenders, which are also used as lifeboats), 36 davits (the cranes used to hoist the lifesaving boats) and six rescue boats for the series of ships being built at STX France. These “boats” have to be delivered well in advance of the ships since they have to be put aboard for sea trials and testing, so the ones for Symphony are now being completed and need to pass tests before delivery, including one rather unusual one because they are a completely new design. About six weeks ago the Prime Minister of the Bahamas let the cat out of the bag that Carnival was very close to signing the paperwork to build a port and private resort on Grand Bahama Island. Today, Carnival made it official and signed an agreement with the Bahamas. And they started talking details. For those who collect things, there's always the problem of what to do with it when we collect too much, especially when we move. For most of us, it probably means a garage sale. For those who collect on a bit higher level, such as Holland America Line, it means an auction at Sotheby's. When Holland America transferred Statendam and Ryndam to P&O Australia, there were some exquisite pieces of Holland America decor that just wouldn't fit into P&O's sleek modern plans, so they are being auctioned by Sotheby's in London on May 2. MSC opening MSC Bellissima for sale almost two years before the ship enters service.